ABC's Kevin (Probably) Saves the World Series Premiere: Grade It! Older TV Shows I've been meaning to check out. 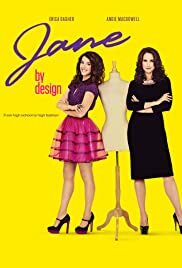 How many episodes of Jane by Design have you seen? Q: How can I audition for the Casting Director on the ABC Family show "What Would Jane Do"? For someone who has watched a few (or more...) TV series, this is a classic, by-the-book, teen show. Like The O.C., 90210 and Gossip Girl have already proved, when you put pretty faces in pretty, and expensive, clothes, you have yourself a TV show. Jane is a high school student and she is supposed to be unpopular, an outsider, "dateless" to quote the storyline description. I am not sure how this fits with her going to school every day in extravagant dresses, high heels and tons of makeup. Jane loves fashion and designs most of her clothes. After a misunderstanding, she lands her dream-job, assistant in a big-time fashion company. Where they think she is an adult. Now she has to juggle two secret lives, one in high school, and one in high fashion. The plot revolves around troubles Jane faces at school, at work or at home. She always manages to cope, with some help from her best friend, Billy. The cons: The whole situation is completely unrealistic, from Jane's clothes, to her platonic friendship with Billy, to people getting jobs at their local high school whenever they feel like it. The dialog is totally predictable. If you've watched high school shows before you can guess what the next line's going to be. Jane has an annoying quality I can't really put my finger on... but I didn't like the main character, and that of course is a problem. The pros: No one expects you to take this seriously. The clothes look good. Billy looks even better. All of the supporting cast is lovely. Jane always manages to turn things around and make it work, which gives the show a nice optimistic note. P.S. I kept wondering why she has to change when going from school to work. Her outfits are already over-the-top. It would make more sense if she wore something more "normal" to school. P.S.2 The first half of the season is better paced, in the second half new characters are introduced and that usually stretches the plot a bit much.